The countless realizations of the childhood fantasy "Peter Pan" are more common than remakes of "The Hunchback Of Notre Dame," but probably more effective. The story visualizes a place where children can stay any age they wish, battle pirates, swim with Mermaids, and fulfill all sorts of adventures without the discipline of a parent to interfere. In other words, a dream come true for any little boy under the age of seven. "Peter Pan" was certainly one of my faves at the time. But each of us has a soft spot for childlike myths even after the years have passed by, because such stories constantly remind us of the fearsome possibilities of youth and its many adventures. Could this explain why there are so many interpretations? Partially. But I think the subject endures so many remakes simply because it seeks exposure to each new generation. Most of the renditions, though, are produced for the stage--there have only been a handful of movies using Pan as the source material. Then again, movie audiences demand much more than just the same old story being reinterpreted over and over again on the screen. Director Steven Spielberg surely knew this when he went into the studio to make "Hook"--instead of adapting the premise in straightforward and predictable behavior, he chose to approach it in a way no one had ever done before. Spielberg has always been one to imagine his films without the weight of clichés dragging them down--"Jurassic Park" and "Close Encounters Of The Third King," two of his most imaginative, are validation of this theory. His movie about the adventures of Neverland, interestingly, is also one of the few to successfully stray from the basic Peter Pan story. The picture stars Robin Williams as Peter Banning, a business man who, while having two small children, seems detached from his family life. Swarmed by the pressures of his job, and with a cellular phone always at his ear, he picks up the family and takes them to London for a visit with Granny Wendy (Maggie Smith)--the woman who adopted Peter at twelve and raised him to the successful man he is today. A feeling of nostalgia looms in the air once the story establishes its motive; the children fall asleep in the same bedroom that Peter found Wendy, John and Michael in; we see a beam of light streak through the window; and then suddenly the kids are gone. What happened to them, you ask? They were whisked away to--you guessed it!--Neverland by the notorious Captain Hook. What for? To lure his rival, Pan, back to the second star to the right for a final showdown. But through other such details, we learn that Banning has amnesia of everything that happened before the age of twelve; his memories of the Lost Boys, the Mermaids and even the pirates, have been erased. The possibilities go farther, however, when Tinkerbell (Julia Roberts) shows up at his window and takes him to Neverland regardless of his memory lapse. The significance of the story is, theoretically, to see what it would be like for Pan to grow up. But does that defeat the whole purpose of the myth? Not really. All children need to grow up. And thankfully, the story doesn't leap beyond the fantasy or imagination to dwell on the details of how he is a successful business man. Robin Williams is good at this type of stuff--his vibrant ambition on screen feels extremely appropriate for the Peter Pan persona. Too bad he doesn't make many movies like this anymore--most of the stuff he's doing nowadays resorts to cheesy melodrama. 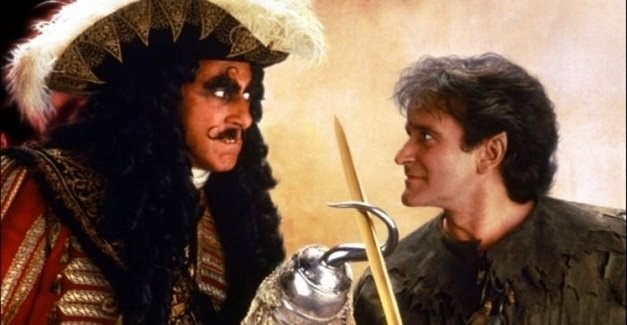 I saw "Hook" twice during its theatrical run in 1991, but did not admire it. A third viewing on DVD, and suddenly all the fond memories of the Peter Pan myth came back to me. My only explanation: age and experience has drawn me away from the myth in the same way it has Peter Banning. So it is understandable, I guess, that I accept the film this time around; I have been separated from the spirit of Peter Pan long enough to know that I have missed it dearly. The movie is a strong reminder of the freedom of youth and the quest for pure adventure, one that looks to the stars and sees the possibilities are as bright as a child's own imagination.